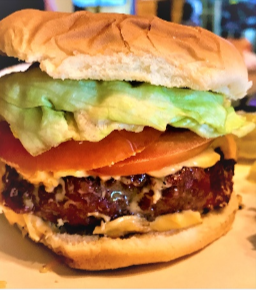 3 Ways to Spice up Burger Party - Latin Touch, Inc.
Burgers are my favorite lunch to grill over the coals of my Caja china, while dinner is roasting inside (plus, I'm cheap, and hate the ide of wasting those beautiful glowing coals by not grilling SOMETHING over them, lol). Now, there's not a thing wrong with the good old-fashioned American Cheeseburger, in fact, it's awesome, but if you feel like expanding your horizons just a bit, here are my three favorite "gourmet" burger styles. All the patties are prepped and grilled the same way, so it's easy to make a big batch of one recipes, or let your guests choose which style they want to try. I like to sear my burgers REALLY close to the fire, so I flip my top grill(s) over so that the grates are resting directly on the coals. You can also “re-purpose” an old flat grate from another type of grill. Works great! Form beef into four (6 oz) patties, slightly larger in diameter that the buns, and season generously with salt just before placing burgers on grill. Grill burgers for 4 minutes, flip, sprinkle generously with black pepper and grill for 3 more minutes. Remove burgers from the grill and rest 10 minutes, tented loosely with foil. 8 slices of thick bacon, cooked crisp. Combine the cream cheese, blue cheese and half of the bacon (chopped). Set aside at room temp. Grill the patties, and sprinkle each with a little garlic powder, as it comes off the grill, then place on the bottom buns, on top of the tomatoes. Spoon the bacon-cheese spread the top of grilled burger patties. Top with remaining bacon and buns. Serve. 4 soft hamburger buns, split and lightly toasted on grill. Fry bacon, and drain on paper towels. Heat a lightly oiled cast-iron skillet, over medium-high heat. Add onions and season generously with salt. Fry until the onions are well browned, about 2 minutes, add the cooked, chopped bacon for the last 30 seconds, or so. Immediately spoon the mixture onto the bottom burger buns, and cover with top buns (this allows the onion flavor to steam into the bread. Add burger to bottom bun, then spread the inside of the top bun lightly with yellow mustard. Make 4 singles, or 2 doubles! Note: For even more of that charred, smoky flavor, cook your onions over indirect heat, on a well-oiled grill. 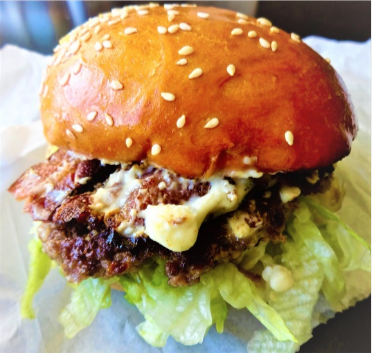 Nope, it’s not just a gimmick at your favorite burger joint, the savory, umami combination of bacon, and beef, dill pickle, and crunchy peanut butter is out of this world! 4 soft hamburger buns, split & lightly toasted. Prep you Caja grill top(s) for 2-zone grilling. Whisk together peanut butter, honey and chipotle powder. Dredge your bacon in brown sugar, and grill over indirect heat until just starting to crisp (about 10 minutes per side). Set aside and keep warm. Spread peanut butter mixture on each top bun. Assemble burger with bacon, onion, pickles, and tomatoes. Serve and enjoy!